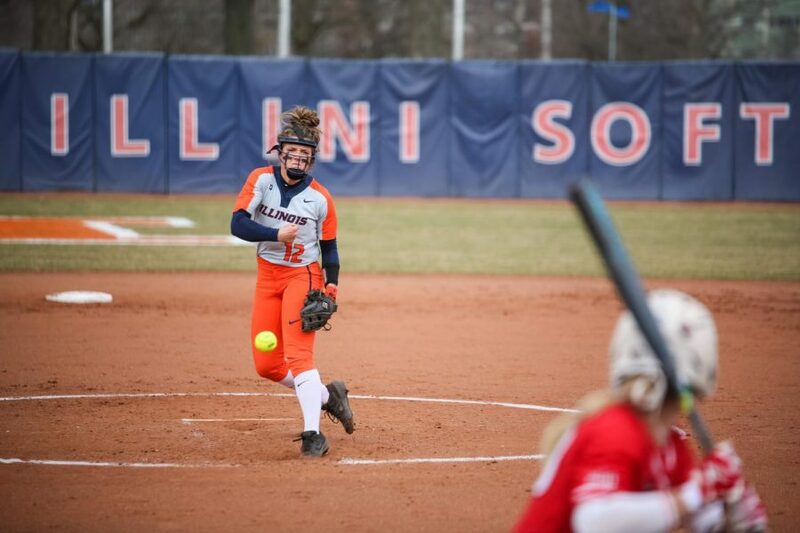 Taylor Edwards pitches at Eichelberger Field versus Illinois State on April 3. The team has learned to focus on the moment rather than worrying about prior plays. 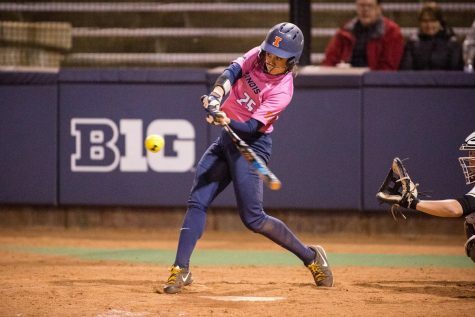 Illinois softball traveled to Iowa this weekend and grabbed its second Big Ten series, 2-1. 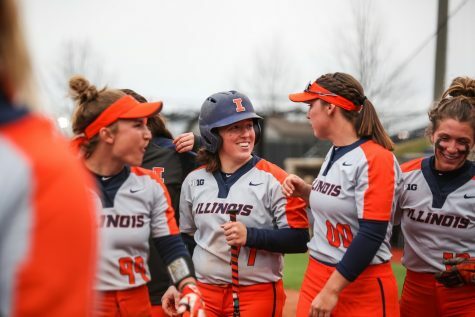 Heading into Iowa on a three-game losing streak, the Illini won 12-1 Friday and then split the doubleheader on Saturday 12-11 and 4-3, respectively. 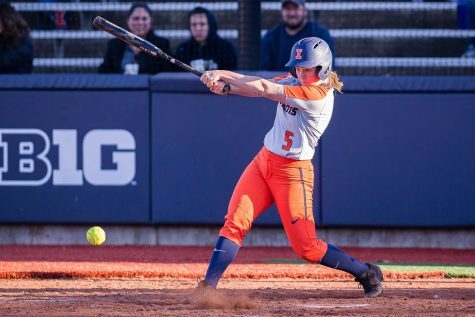 After scoring just 11 combined runs over the past six games, the Illini offense looked as alive as ever, scoring 27 runs on 34 hits in just 20 innings this weekend. 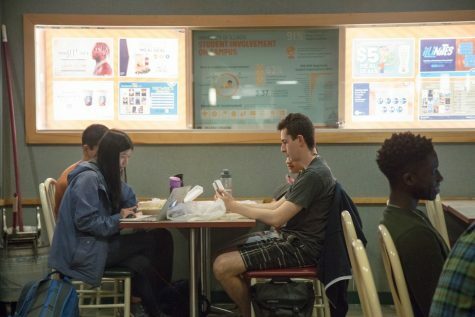 Illinois moves to a 26-14, 6-6 record. 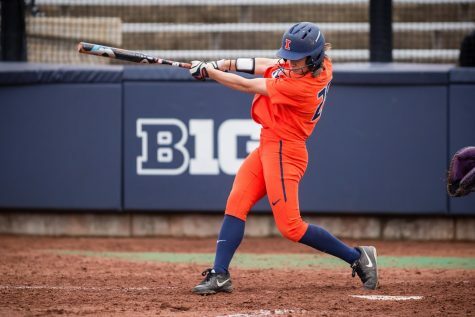 Redshirt senior Carly Thomas powered the Illini, going 6-for-12 from the plate this weekend. 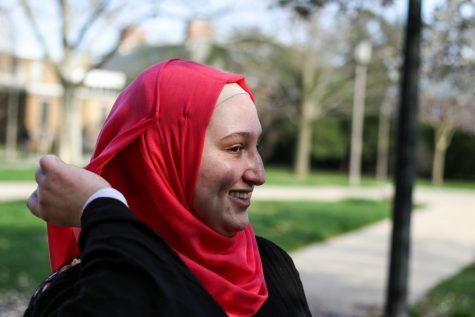 She was fueled by a grand slam in game one, a double in game two and a home run in game three. Thomas also added eight RBIs and seven runs. 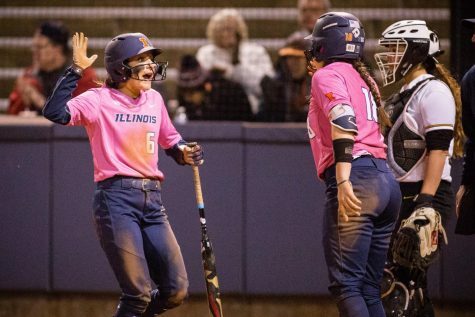 In Friday night’s contest, Illinois’ offense never let off the gas, using two grand slams to run-rule the Hawkeyes 12-1. Freshman and Indianola, Iowa native Sydney Sickels led the defense in her home state. Sickels allowed just one run on one hit through four innings while also striking out six. The Illini set the tone early with two runs in the first inning. Senior Kiana Sherlund got things started with a bunt and a stolen base. Thomas quickly scored Sherlund with an RBI single that landed her at second after a throw. Sophomore Bella Loya gave the Illini the 2-0 lead with an RBI single to score Thomas. Both Illinois and Iowa picked up a run in the second inning. Iowa had a solo home run to shrink the lead to 2-1. Redshirt senior Annie Fleming doubled to left field to score freshman Avery Steiner after she previously singled to left. Thomas and Loya singled to start the third inning, followed up by a two-out single from sophomore Rhein Trochim to load up the bases. 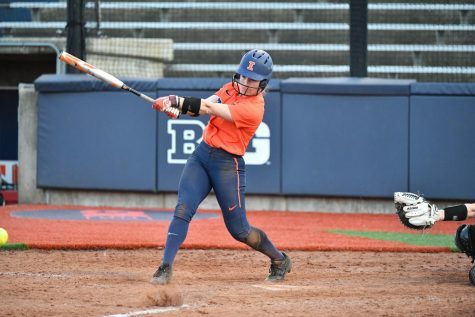 Sophomore Katie Wingerter blasted a grand slam to give the Illini a comfortable 7-1 lead. Senior Veronica Ruelius added on the eighth run in the fourth inning with an RBI double to score Thomas. In the fifth inning, the Illini loaded the bases again off a Trochim single and back-to-back walks. Thomas cleared the bases with a grand slam of her own to secure the Illini win. 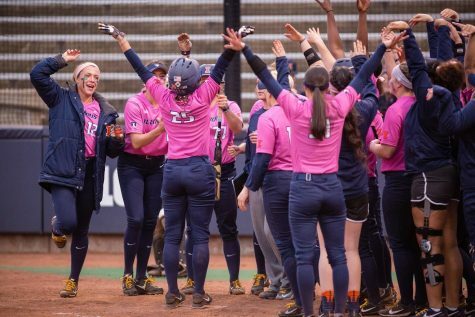 After the run-rule win, the Illini came out just as hungry on Saturday to take the series win. Similar to Friday, the Illini gained a 2-0 lead in the first with a sacrifice fly from Thomas to score Fleming, followed by a home run from Loya. This time, Iowa fired right back with a bases loaded walk and a RBI ground-out to tie the game at two in the bottom of the first. The Hawkeyes started the second inning right where they left off, scoring five runs led by a grand slam of their own. Both teams grabbed a pair of runs in the third inning to advance Iowa’s lead to 9-4. The Illini worked to cut into Iowa’s lead, scoring another two runs in the fourth inning led by a two-run homer from Thomas. The Hawkeyes tagged on another run in the fifth inning while leading 10-6. 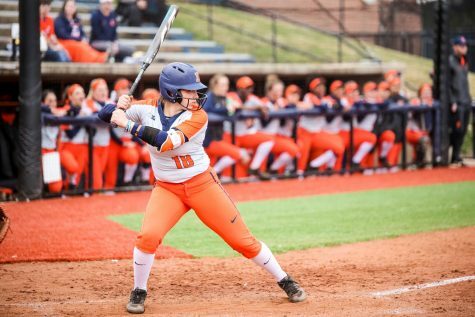 Illinois hit their stride and made the comeback effort with a six-run sixth inning to lead 12-10. The Illini made it through the entire order, hitting six-straight without an out. Fleming’s RBI triple led the inning, as well as RBI’s from Sherlund, Loya, Ruelius and freshman Kailee Powell. While Iowa recorded another run to close the game at 12-11, the Hawkeyes failed to regain the lead. 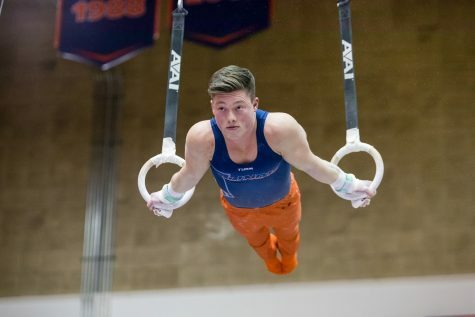 Perry believes the comeback effort came down to Illinois’ focus. “We’ve learned to just play and not worry about what happened in the last inning or on the last pitch but to just focus on what’s in front of us,” Perry said. 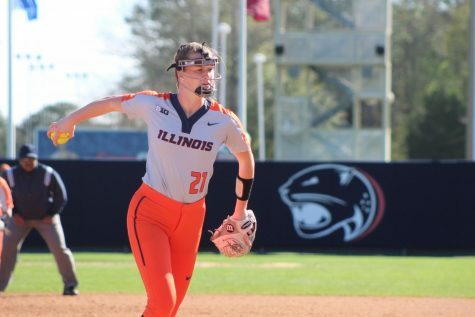 Although the Illini hoped for a series sweep, their efforts fell short as Iowa made a comeback of their own to take the back half of Saturday’s doubleheader. This time, Iowa struck first with a run in the first inning off a fielding error. Illinois quickly returned the favor in the second inning with an RBI single from Wingerter and took the 2-1 lead in the fifth off an RBI from Ruelius. Loya added on an insurance run in the seventh inning with an RBI single to score Fleming. However, the Hawkeyes used a double to score two runs and tie things up in the seventh inning. After the Illini had three quick outs in the top of the eighth, the Hawkeyes loaded the bases and scored an unearned run off a fielding error to prevent the sweep. 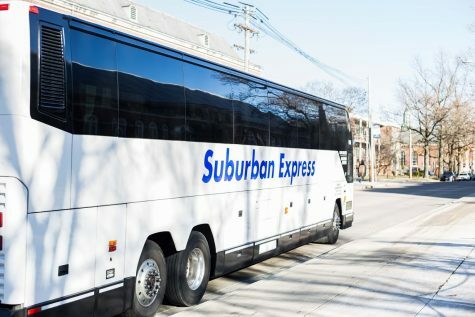 Despite the third game’s outcome, the Illini are ready to use their offensive momentum as they head back home to host Southern Illinois University, Edwardsville on Wednesday, followed by No. 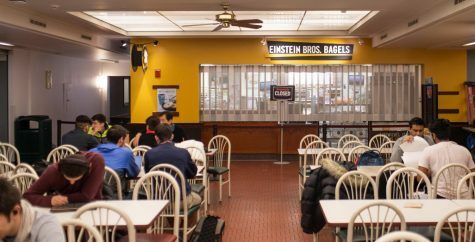 18 Michigan over the weekend for another Big Ten series.